Dr. Huffman's research specialty is Fourier-Feynman Transforms. 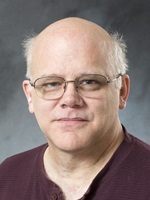 His work has been published in the International Journal of Mathematics and Mathematical Science, Transactions of the AMS, Rocky Mountain Journal of Mathematics, Michigan Mathematics Journal, and Journal of the Korean Mathematical Society. An academic correspondent of the Casualty Actuarial Society, he teaches many of the upper-level math classes at Northwestern.